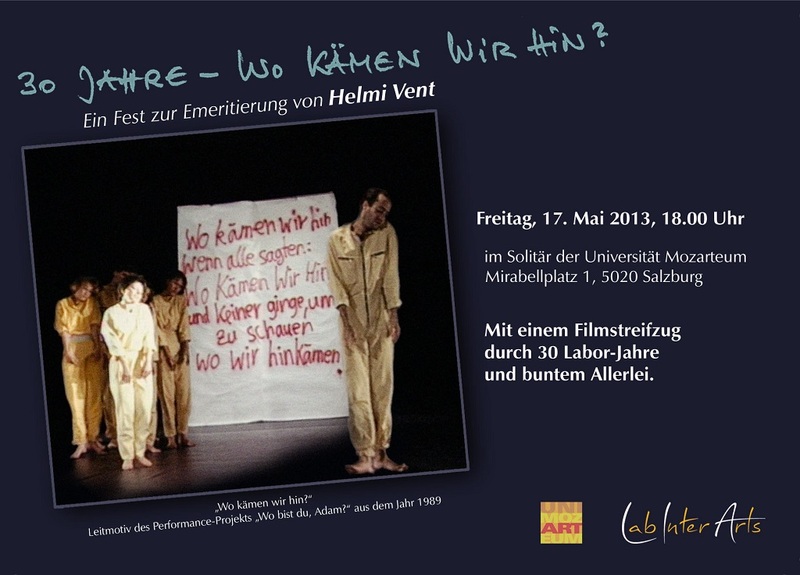 Helmi Vent [LIA - Lab Inter Arts] - 30 Years – Where Would We End Up? Helmi Vent [LIA - Lab Inter Arts] - 30 Years – Where Would We End Up? commemorating thirty years of Helmi Vent’s workshop projects at the Mozarteum University Salzburg. An 80-minute exploration of selected annual TanzMusikWerkstatt (DanceMusic Workshop) projects (1983 - 1992), the Dance Music Theatre Workshops (1993-2008) and the LIA – Lab Inter Arts projects (2008 to 2013). The film’s leitmotif is “Wo kämen wir hin?” (Where would we end up?) inspired by the 1989 performance project entitled “Wo bist du, Adam?” (Where are you, Adam?). In: p/art/icipate – Kultur aktiv gestalten (Producing culture actively). Issue # 03, eJournal of the program area Contemporary Arts & Cultural Production.